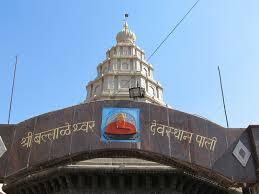 Here is Some Information about Ballaleshwar Temple in Pali Raigad Maharashtra India. The Ballaleshwar Ashta Vinayaka temple is located in Pali Raigad Maharashtra.Ballaleshwar Ashta Vinayaka temple is situated between the fort Sarasgad and river Amba.The temple was built by Shri Phadnis of Moradabad in 1770.Ballaleshwar temple is Dedicated to Lord Ganesha.Ballaleshwar temple is among one of Ashta Vinayaka(Eight temple of ganesh) temple of Maharashtra.Two lakes can be seen on the two sides of the temple. One of them is reserved for the puja (worship) of the Deity. The Balleshwar idol is 3feet high and is seated on a stone throne. The idol’s trunk is turned towards the left and there are diamonds in its eyes and navel.There is a bell made by portugese inside the temple.The idol is has silver background with trank turned to the left where to Riddhi and Siddhi placed the each side of the idol.The idol's eye and navels are made of diamonds and the temple facing to the east show increase of beauti of the temple. The temple is of Shrikari style, which means in a shape like the letter ‘Shri’ in the Devnagiri script. 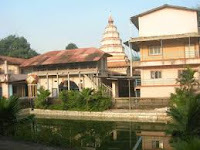 The unique feature of this architecture is that, during dhakshinayana (southern declination of the sun), Sun’s rays fall on the idol of Lord Ballaleshwar. Out of the two sanctums, the outer sanctum depicts Mooshika idol of Ganesha, where a mouse is placed facing the deity and grabbing a modak in its paws. The idol of Ballaleshwar is placed inside in the other sanctum. 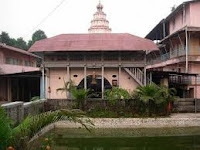 The Ballaleshwar Asthavinayak temple faces east and has to sanctums. The inner one has the idol of Lord Ballaleshwar and has a Mushika (Ganesha's vehicle, the rat) with modaka in his forepaws in front of it. The hall is supported by eight carved pillars. Inner sanctum is 15 feet tall and outer one is 12 feet tall. There is a huge bell that was brought back by Chimaji Appa after his defeat of the Portuguese in Vasai and Sasthi. The main hall of the temple is 40 feet long and 20 feet broad. It contains 8 pillars which resemble cyprus tree.Really the temple is very beautiful and the plece is very peacefuland naturally. 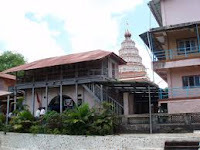 The History of this temple was part of pali.In the Konkan Pallir village now known as Pali there lived a young boy Ballal who was a very sincere devotee of Lord Ganesh. Son of a rich family, his pre-occupation with worship at a young age displeased his father. Ballal spent a large part of his time in worship and influenced his friends to do so too. His friends parents felt that Ballal was misleading their children by showing them the Bhaktimarg (the path of devotion) at such young age. They asked Ballal's father to restrain him. His father went to look for Ballal and found him in the forest engrossed in his worship of Ganesh. He disrupted the puja, threw away the idol of Ganesh and beat his son. Not content with this he also tied him to a tree. He then left Ballal in the forest asserting that 'let Ganesh Himself come and rescue him'. Consequently, the parents of Ballal’s friends got fed up of their children not being at home at regular times, especially at meal times, and complained to Kalyan Shetty about his son’s influence on their children. Kalyan Shetty got so angry with Ballal that he started beating him with a stick. He even took the temple idol and broke it. He tied Ballal to a tree to punish him & told him that he would see how Ganesha would rescue him from this predicament. However, though Ballal started bleeding from the bruises he got when his father hit him & was tied to a tree, he was totally unaffected because, even at that time, he was absorbed in the thoughts of Lord Ganesha. Pleased with Ballal’s devotion, Lord Ganesha himself suddenly appeared in the form of a Brahmin before Ballal and told him he would grant any wish he wanted. Immediately Ballal said “Let Shree Ganesha always remain permanently here. Let this place be ganeshmay (full of Ganesha)”. Lord Ganesha right away granted his wish by saying “Tatastu (So be it)” and vanished. At the very place Lord Ganesha vanished appeared a huge stone slab which was immovable. It is this slab which today is the idol of Ballaleshwar & one of the many names of Lord Ganesha is Ballal Vinayak. 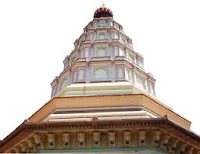 The doors of the Ballaleshwar temple are opened at 5 Am in the morning and the devotees can start worshiping the Lord Ballaleshwar from 5:30 Am onwards. Shodopachari Puja is conducted before 12:00 Pm in the after noon. The Panchamriti Puja is conducted after sun set. The temple is closed for the devotees after the last puja and after this the deity takes rest. On giving appropriate money, the temple poojari will perform Abhishek, Pooja and Sahastravartan. Devotees can offer the following Puja –s at the temple. By Rail : The Nearest Railway station is Nagothane station.(15kms). By Air : The Nearest Airport is Pune and Mumbai Airport(110 Kms).